The voucher for our online shop is a wonderful gift idea – for friends, family or even yourself. Because we do not offer “only” sustainably grown coffee and coffee cherry tea. With the added value that Panda Coffee guarantees, every buyer of the coupon will support the fair economy along the value chain of our coffee. With each purchase of vouchers our aid organizations are supported – it is the value of shopping that counts. Even if it has not been redeemed, we donate. And best of all: the value does not fall. 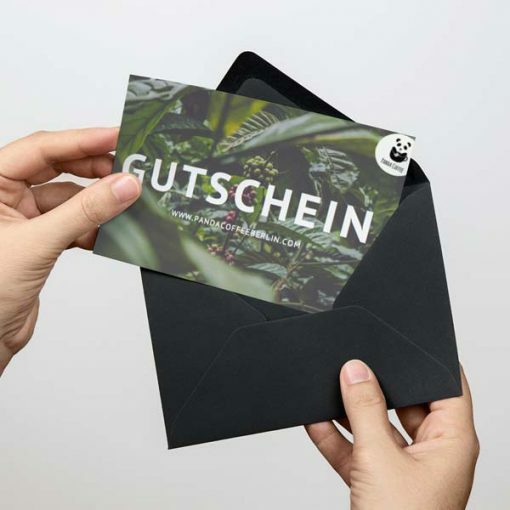 So, when you buy the voucher, you may be able to make a decisive contribution to building a well for the Neven Subotic Foundation, for a life-saving heart surgery, or for realizing a project for endangered animals. In addition to coffee and tea, we will offer more goods in our shop. Therefore, you can soon use a coupon for new products around coffee, which must meet certain criteria just like our previous product range.